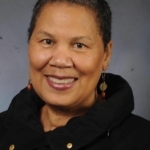 KFW is profiling Estella Conwill Májozo for Black History Month in honor of her dedication to social justice and extensive efforts to highlight the achievements and struggles of African Americans and spark social change. Dr. Estella Conwill Majozo is not done telling the story of African American history. Her extensive work providing stories, rituals, rites and monuments that document the struggle for racial justice in America and seek to lift up African Americans carries on. Last summer, she helped create a summer-long, public arts celebration:  The Freedom Clothes Project, a book and community arts series celebrating the escape of Kentucky-based slaves Thornton and Lucie Blackburn. “I wanted to look at history, fight against oppression, and celebrate the couple who struggled together and made it to freedom. I was fascinated by the sacrifice that was involved,” said Majozo. The Blackburns fled Kentucky by steamboat from Jeffersonville, and took a stagecoach from Cincinnati to Detroit. They were jailed in Detroit, but freed when a freed woman exchanged clothes with Lucie allowing her to escape and a group of protestors stormed the men’s jail and freed Thornton. The couple escaped to Canada. “I think of the ripples in time—if Thornton could see Muhamad Ali throw his medal in that selfsame river, if they knew about the Underground Railroad Museum in Cincinnati or could see modern Detroit. But there are ripples in time that need to be ironed out. Much of the same oppression that happened then is happening today with young black men being taken down by the police,” said Majozo. Majozo was instrumental in writing Ringshout the Route, which has been developed into a National Rite of Initiation into African American Culture. “I was working on a national rite of passage for our young people when I was at University of Louisville (she is now retired), but it wasn’t complete until I took it into the community. There were workshops, leadership training, a national dance and song all designed to prepare young people for adulthood,” said Majozo. Working with her late brother, Houston Conwill, and architect Joseph DePace, they developed The New Ringshout: Memorial Tribute to African Burial Ground in the Federal Building in New York City. This is one of several monuments, including Revelation: Martin Luther King Jr. Peace Memorial at Yerba Buena Garden, San Francisco (cited by Ebony Magazine as the most unique of all the King Monuments); Rivers: Langston Hughes Memorial at The Schomburg–a Cosmogram under which lies the ashes of poet, Langston Hughes (recognized by the Excellence in Design Award, Art Commission of New York); The Stations Project at The Castellani Art Museum of Niagara University (selected by the National Endowment for the Arts as one of the best projects in the nation 1993), they developed together. “Our work and the work of others like Maya Lin have splattered this landscape with some truth. This has helped shift the dialogue of who we memorialize and why and to what end,” said Majozo. Majozo hopes that activists will note what she has done, but make their own path and strive to go beyond what she has accomplished. There is much work to be done. “I was speaking with a young lady who said her father asked, ‘When will they get over it?’ I told her we will get over it when it is over.